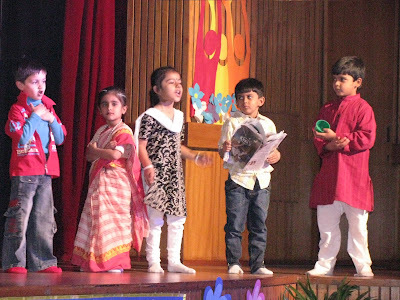 Anirudh's school holds a separate Annual Day for Nursery and KG kids. I really liked the idea of a separate one for such small children. He was part of a play where he was supposed to play the role of a granpa. 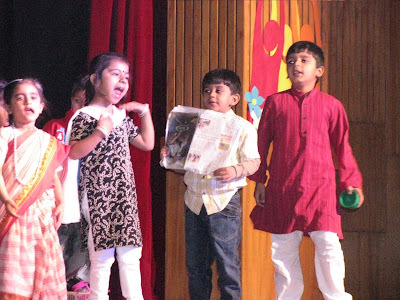 He told me about this play about 15 days ago and said "Pata hai. Main dadu hoon!". I looked at him a bit bewildered wondering what he meant. 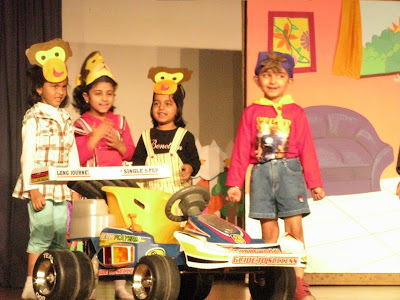 Later he explained me that he is in a play where there is a boy Ken who doesn't take care of his toys and his dadu helps him fix his toys. He then proudly told me that he is playing the role of Dadu. Coming back to his performance, after the experience from the open day and also from one of the rehearsal sessions I attended, I was not sure he would say his lines. But the moment he entered the stage, it didn't matter to me if he would say it well or not. Just seeing him on stage made me feel so very proud of my lil guy. But then today he said them just perfectly making me even more proud. 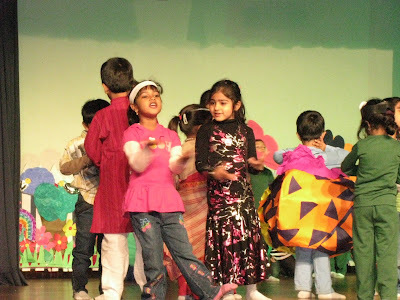 Its another story that after saying his lines, he was standing with his back towards the audience (as you can see in one of the pictures below) and playing with the other kids on the stage. cute! and as I said before, a good function. The kids are so telented at such a young age. Amazing! Welll done Anirudh. He sure looks like having a good time on stage. No wonder u r so proud of him. 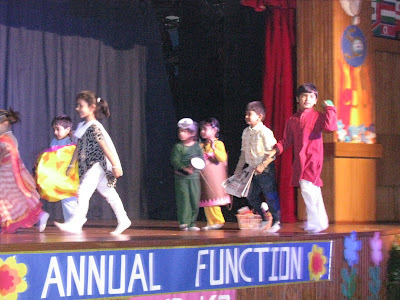 So cute :) Many mubaraks on the grand stage performance!